This sponsored post is part of my ongoing project #ExperienceBuick. Throughout 2015, I will be experiencing Buick through a series of events and initiatives that reinforce what this American car manufacturer brand is all about. The plan was for Mr. Misadventures and I to drive from our home in Berkeley to Bend, Oregon for a family reunion. 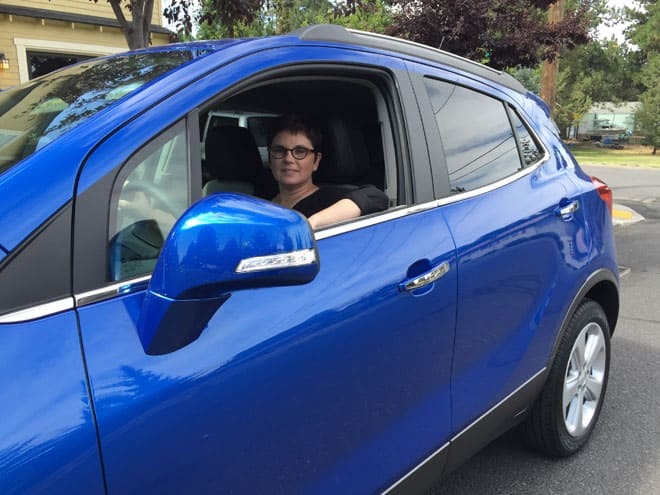 My mom’s side of the family gets together once every five years for old time’s sake and instead of flying to Portland, renting a car and driving to Bend, the lovely folks at Buick lent me a car so that I can #ExperienceBuick. And experience it we did. There are so many things that we liked about the Encore. A few things we didn’t. I’ll share both, because it is important to me that my reader’s understand that although my year-long project with Buick is a paid engagement, I always share my opinion unaided. We left on Friday morning, drove several hours through Mt. Shasta and picnicked across the Oregon border. 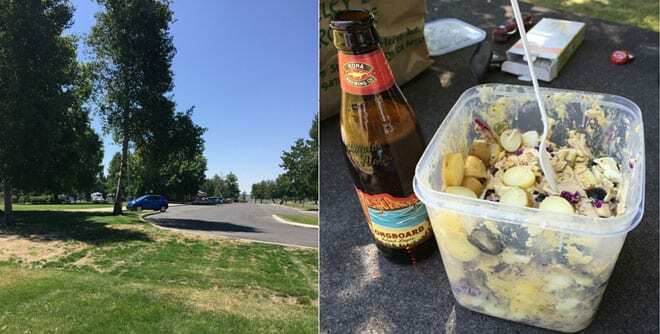 We love picnicing, it is one of the best parts of road-tripping! Especially when my hubby prepares such amazing picnic food! When we arrived in Bend we met my parents, aunts, uncles and cousins for dinner on Friday evening. After 8 hours in the car, you’d think we would be exhausted but we arrived refreshed and ready to socialize. We spent Saturday and Sunday going back and forth between family events in Bend and Sunriver and hailed my parents around the entire time. We left early Monday morning to return to the Bay Area and had another flawless day of driving. – It handles like a dream. Quick lane changes, mountainous curves, this baby is as smooth as pie. – The GPS is protected from the sun. On our current SUV, we sometimes can’t see the GPS screen if it is a bright day, we never had this issue on the Encore! – The command console (what I call it) is in a really good spot from a usability perspective and the minimalism of the controls makes it less distracting. 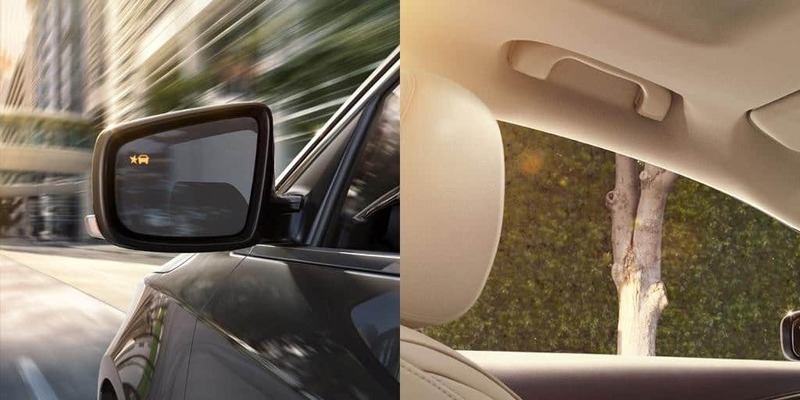 – There is excellent visibility throughout the car, the field of vision is impressive. – The head height is really spacious, my hubby is 6 feet tall and he didn’t feel crowded. Also the leg space is fantastic. – There are lots of miscellaneous storage pockets in the front, plenty to places to stick your phone, your bottle, your everything! – The integration with Apple products meant we could just plug and play our iPhones and listen to music without needing a cable. The only problem was deciding who got to play their playlist! – Proximity alert – this is my FAVORITE feature. 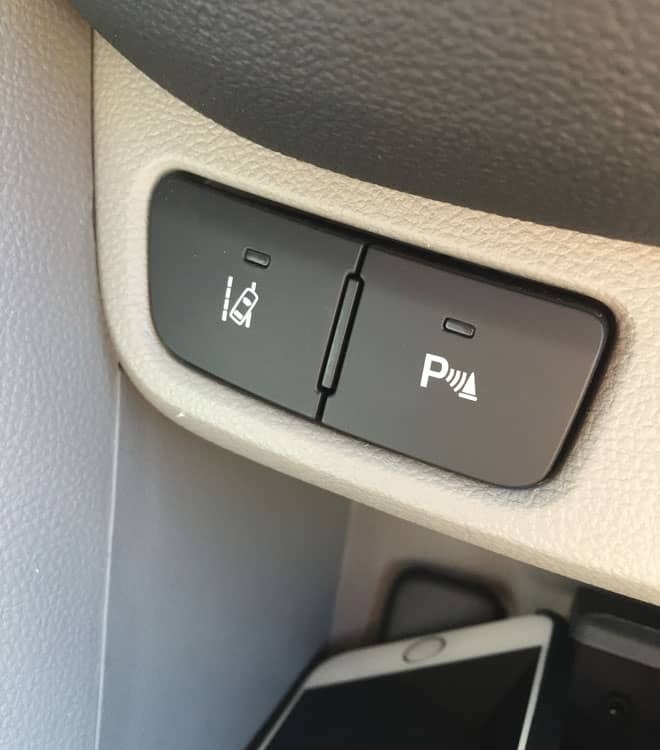 When turned on it will beep if you get too close to the car in front of you – great for training people not to tailgate! – Side Blind Zone Alert – this is my second favorite feature. When changing lanes this nifty feature lets me know if there is someone in my blind spot. I can also see when someone is passing me on the right or left. – There isn’t quite enough storage for us. We are pack rats when we go on a roadtrip. My hubby as a ton of photo equipment, we bring picnic supplies, and on this trip we had a large suitcase. 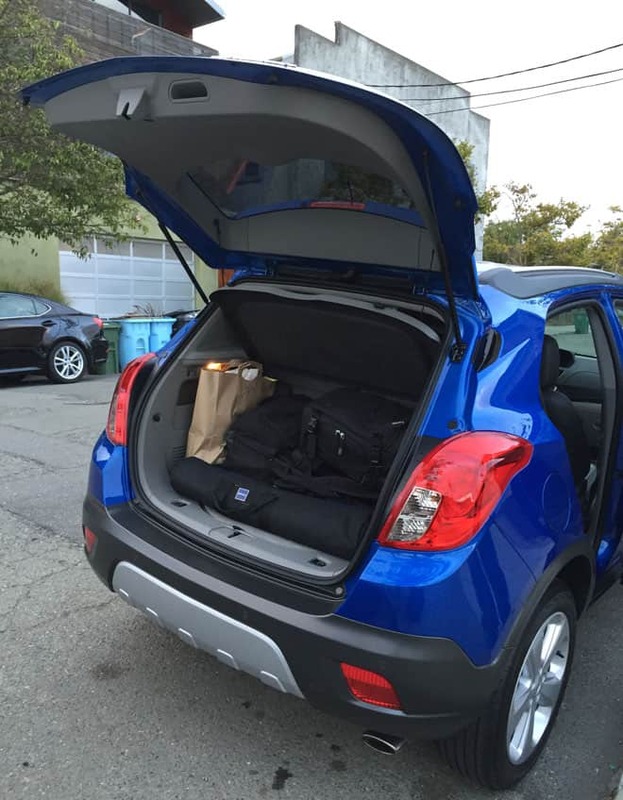 We couldn’t get it all in the back and would need to move up to a larger model to accommodate our trip-style. – The rearview mirror “box” is a little larger, I found it a little distracting. – The armrest for the driver is too short, my hubby is a big guy and he could not rest his arm comfortably, it was fine for me when I drove. Also on the armrest front, I really missed having one on the passenger side. Overall, I can honestly say that this is a great car. It handles super well, it is functional (which is really important on road trips) and it is designed-well. For the Misadventures family personally, we need a Buick with more storage capacity (unless the hubby agrees to sell all his camera equipment…) but that just means we need an Enclave! Thank you to Buick for lending me the Encore for my extended weekend roadtrip to Oregon! What about you? What do you look for in a car when it comes to roadtrips? This looks really nice! I have always been a fan of Buicks. I love how much space is offered! I look for an amazing sound system when I go on road trips. I also love an interior with a lot of room. Being cramped for even an hour is no fun. Buick makes good cars. I just find that we need bigger vehicles with more storage space and room to space out my kids! Otherwise this sounds like a great ride! Great review. Love the pros and cons. I am a big fan of having lots of headroom and legroom as my husband is very tall. I also love having lots of nook and crannies for all my “stuff”. I used to drive a Buick and it was one of the best cars I have ever owned. I am not in the market for a new car right now, but when I am. Buick will be one I test drive. I love hatch backs! I have always dreamt of owning one. That car is beautiful. I love the park assist and the colour is outstanding! This looks roomie. I need a nice SUV to tote my and my kiddo around. I love the look of the Buick too. I will keep this in mind for down the road. Looks like a really nice car. I’m all for lots of leg room! For us, just please have comfortable space for our dog, and all will be just fine. I have to admit that I have always been a Buick lover my whole life. 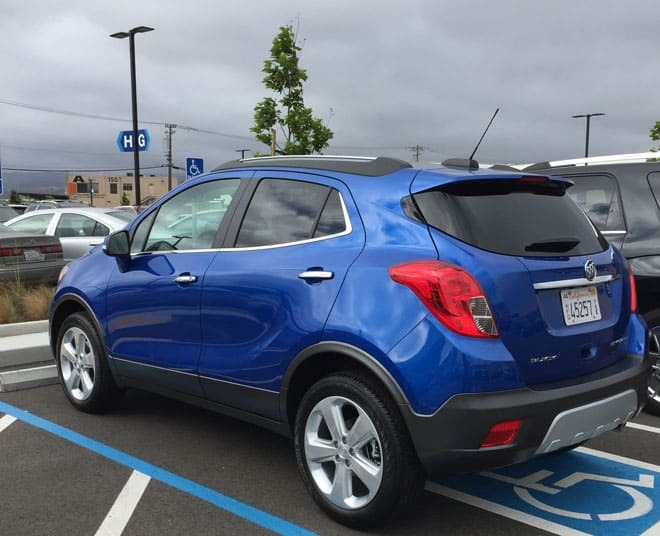 This Buick Encore sounds totally amazing and I so love that blue color. I would so love to have this vehicle with all these awesome features. Thanks so much for sharing. @Rebecca, it was a great ride, I was really impressed! It’s definitely a cute little car! Though with two 60lb mutts, I’d need something slightly bigger, too. Does Buick make some type of mini SUV? That’s likely what I’ll be looking for to replace the one I have when she dies. (190k+ miles and counting!) I like something small and maneuverable, but where I sit up high and the seats can come down to make plenty of room for hauling if I need it. Car companies to make enough small SUVs — to me they’re ideal! @Katie, this is considered the mini-SUV so you might need to go up to an Enclave. Looks like a nice compact car with lots of high tech features. I also agree with the truck space. I wish they had it bigger. Great review! Nice looking car! I have never driven a Buick, but I heard so much about this brand. I would definitely consider this if we are in the market for a new car. @MyKidsGuide, definitely do, especially since you can take it for 24 hours! We never had a Buick but our neughbor has one and they love it. Thanks for sharing your experience. This looks like a great car. I love that color! I never had a Buick but would love to test one like you did! @Melissa, you can take one for 24 hours, a whole lot of testing can happen! Comfort is key for me but also something with a good boot space. With 2 kids, I’m going to have loads of luggage. Looks like such a sweet ride. I have heard nothing but great things about Buick.. Everyone I know who owns one loves them and will only buy them. @Jeanine, it was my first time driving one and I was pretty impressed. I have been a passenger many times, but it is different from actually driving! My car is 15 years old. It may be time to start looking for a new one. The Buick Encore looks amazing. @Dina, it was pretty awesome! I love the color of this SUV. I need a new car soon and want another SUV. I would like something a bit bigger than what we have now though. @Christy, you definitely won’t lose this one in the parking lot! We have a new driver in the family. We’d like to get a new car and give our older Camry to our son. This looks like a great ride, but my hubby is a big guy like yours, so it definitely couldn’t be our family vehicle. @Tami, you might consider the Enclave, that’s what we would need as well! I love Buick’s new look!! They are very sporty and I bet they drive great too!! This is a cute car but like you I would hate that it doesn’t have a lot of space and in general I don’t like hatchback cars. Besides that it sounds really nice. Thank you for the review and letting us know that we can try the car out for 24 hours.